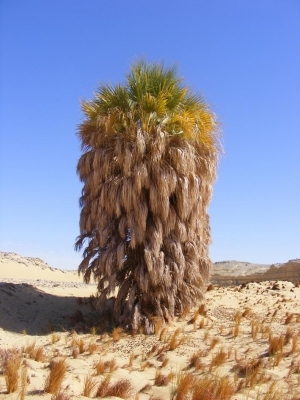 Argun palm is a robust, unarmed, solitary-stemmed, evergreen fan palm tree growing about 6 metres tall. The stout, unarmed bole is topped by a ring of the dead leaves and flowers and then a crown of the fan-shaped leaves. Northeastern tropical Africa - southern Egypt and northern Sudan. ]. Requires a dry, well-drained soil.